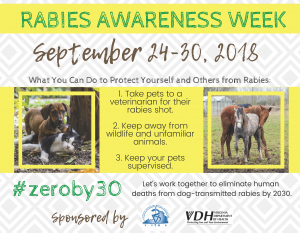 September 24-September 30 is Rabies Awareness Week in Virginia. Rabies is a deadly disease caused by a virus that attacks the nervous system, and is most commonly found in wild animals, such as raccoons, foxes and skunks. Virginia’s Rabies Awareness Week centers around World Rabies Day, which falls this year on September 28. Do not keep wild animals as pets. Enjoy all wild animals from a distance, even if they seem friendly. A rabid animal sometimes acts tame. If you see an animal acting strangely, report it to your local animal control department and do not approach it. Contact your local health department if you think you or your pet may have been exposed.